Totally cannot take any credit for this. At all. But I had to share. Jenny On The Spot does captions for a site called My First Fail and this picture was on that site. Seriously cannot think of anything cuter. 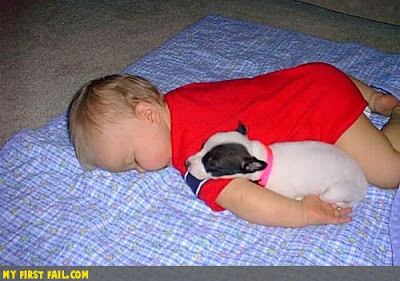 oK..So this is about the cutest thing I have ever seen! Babies and puppys LOVE them! Oh my gosh! That is so sweet. Babies and puppies. That is hard to beat. Love it! That picture is so cute. AWWW! Welcome new commenters! So glad you've stopped by! ohhhhhhh that is way to adorable!